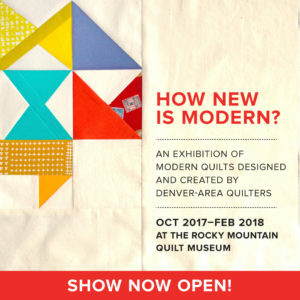 Our “How New is Modern?” exhibit is now showing at the Rocky Mountain Quilt Museum. Opening Reception is Friday, Oct 27th from 6:00-8:00 PM, and we hope to see you all there! Sign-ups are available for our Feb 10th “Improv Paper Piecing Class” with author/teacher Amy Friend. Check your guild email for details. Erin shared her idea to create enamel pins for a DMMQG fundraiser. Our QuiltCon Charity Quilt for 2018 now has 13 participants. Blocks for the quilt top are due at the November meeting. We are actively seeking Board nominations for 2018. Quilt Judge Pam Walsh shared her insights about the process and criteria used to judge quilts. We all learned so much. Thank you, Pam!